Whether you’re a first time manager or have years of experience leading a team, knowing when and how to get input from your team can feel daunting. Fortunately, there are apps you can add to Slack to help you keep important conversations and milestones on track. These integrations will remind you to make time to reflect, get feedback when you need it, and celebrate wins along the way. Discussions about career goals and professional development shouldn’t be reserved for annual reviews. Setting aside dedicated time to connect with your employees on an individual level can help keep them motivated and engaged year round. Frequent, informal meetings like 1:1s give people the time and space to open up and talk about what’s on their mind, whether it’s an upcoming project they need support on, a recent accomplishment they are proud of, or a new skill they are interested in strengthening. The Duuoo app for Slack will remind you to schedule check-ins and even automates collecting meeting talking points. By keeping track of ongoing meeting notes and next steps, you can track progress and coach your employees more effectively. It might sound obvious, but public recognition can go a long way in keeping people motivated and happy. In fact, according to IBM’s Employee Experience Index, 78% of employees don’t feel recognized at work. The Disco app (formerly Growbot) helps your team recognize one another’s contributions, big and small. 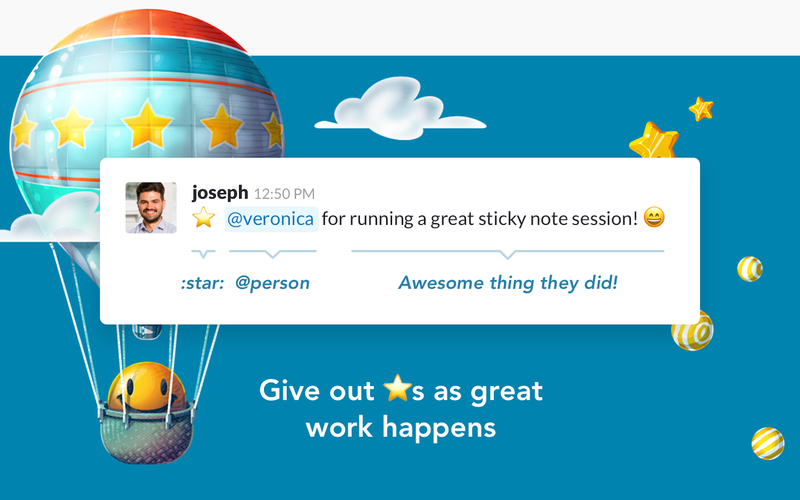 People can give ⭐s to each other from any Slack channel so the rest of the team can see they’ve done a good job and can pile on with more kudos. This simple act of visible recognition can make a big difference and brighten someone’s day. How many times have you had to send out reminders for culture surveys, only to get fewer responses than you’d hoped? Convincing people to take time away from their work to log into yet another tool and complete a long form can be quite the drag. That’s where apps like TINYpulse can help. Their integration for Slack offers a lightweight approach to collecting responses so you can quickly and easily measure and improve your organization’s culture. Send a quick survey like “How are you feeling after the announcement this morning?” and people can respond immediately, right from Slack. TINYpulse will also remind people if they haven’t responded so you don’t have to worry about it. Small rewards can be a nice way to acknowledge hard work. Bonusly is a social recognition app that allows teammates to send instant peer-to-peer bonuses, right within Slack, to colleagues who have gone above and beyond. Bonus points can be redeemed for gift cards from places like Amazon or Target, or you can set it up so employees can cash in their points for an extra day off or to send a donation to a local charity. It’s totally up to you and your team how to structure the rewards to fit your needs. Add these apps to Slack or explore more in the Team Culture category of our App Directory. They’ll help you keep your team happy and productive throughout the year.